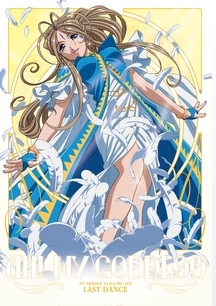 Belldandy and Keiichi are caught up in the battle over the Earth's Fate When The Lord of Terror suddenly takes over Urd! The Lord of Terror summons the Demon gate, and woe to us all if she opens it! The world will be overrun by demons. The Valkyrie, Lind, is sent from heaven to execute The Lord of Terror by any means necessary and whatever host body it happens to be using. Belldandy in turn is given the holy flute to summon the mighty Midguard Serpent to fight, but The Lord of Terror can jump from one body into another, therefore escaping peril. Will she be able to take up arms against her sister Urd, or Skuld, or even Keiichi? In our many years online, we've had 5,122,902 sets of human and robot eyes examine our website.